A book focused on eating less meat, more vegetables, and a variety of whole grains and legumes was of course right up my alley. Diana Henry set out to learn more about what is truly healthy eating, and that’s how her new book, A Change of Appetite , came about of which I received a review copy. Not to worry though; this book isn’t about following strict rules or depriving yourself in any way. It’s about eating more fresh food and saving sweet treats for the weekend or special occasions. And the food here isn’t chosen for health benefits alone. Yes, the dishes in this book are healthy, but they were picked because of flavor first. The chapters are divided into seasons, and there are recipes for every meal of the day and even a special menu for each season. Although I mentioned a focus on less meat, there are still meat dishes included like Japanese Ginger and Garlic Chicken with Smashed Cucumber and Whole Roasted Fish with Tahini Dressing and Barley Tabbouleh. The influences on the food range from Middle Eastern to Asian to Scandinavian and Peruvian to name a few. And, I forgot to mention Indian. I can’t wait to try the Home-style Punjabi Lentils with a spicy tomato topping, Lentil and Roasted Tomato Soup with Saffron, and Roopa’s Indian Scrambled Eggs. The photos show off how beautiful these dishes are as well. The Burmese Chile Fish with Hot and Sour Salad; the Pilaf of Mixed Grains, Sweet Potato, and Fennel with Avocado Cream; and the Roasted Tomatoes and Lentils with Dukka-Crumbed Eggs all look irresistible. It’s no secret that I’m always drawn to dishes with saffron. I had to try the Saffron Roasted Tomatoes with Labneh. Here in Austin, our tomato season starts early. We actually have two seasons, and by late August we’re in between them. Fall tomatoes will arrive a little later. Luckily, we have farmers who sell at our markets that are from areas just far enough north of the city to still have tomatoes when the heat has ended the early season for other farms. I brought home plum tomatoes from Hairston Creek Farm for this dish. To start, the labneh needs to be made the day before serving. Greek yogurt was mixed with minced garlic, finely chopped parsley, and salt and pepper. It was left in a cheesecloth-lined strainer over a bowl in the refrigerator overnight. The cheesecloth should be twisted up and around the yogurt so it can be squeezed from time to time to release more liquid. The next day, the tomatoes were halved and topped with a mixture of olive oil, harissa, and usually I make my own but I was lazy and bought a jar this time, and saffron. The tomatoes were tossed in the mixture in a roasting pan, and they were placed in the oven for about 45 minutes. 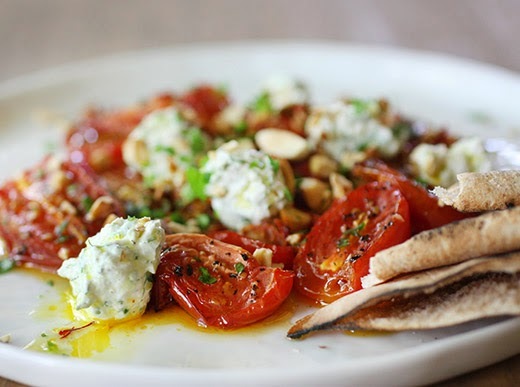 The roasted tomatoes were transferred to a serving platter, the labneh was broken into pieces and dotted around the tomatoes, and chopped toasted almonds were sprinkled on top. More saffron was heated with lemon juice and olive oil, and that mixture was drizzled over the top. I served the tomatoes and labneh with warmed pita. This was my first time making labneh, and I’ll definitely be doing that again. The tangy yogurt, garlic, and parsley mixture could be used in so many ways. 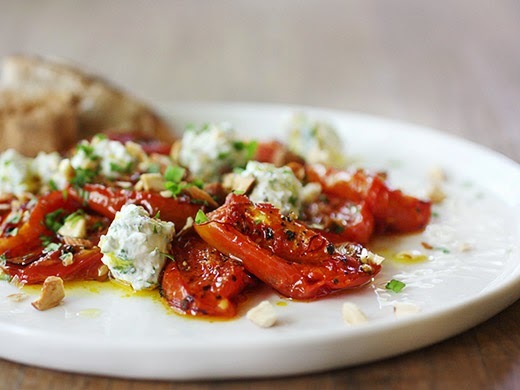 Roasting tomatoes intensifies the flavor, and the saffron gives them a lovely added dimension. The pretty, lemon-saffron oil drizzled on top brought even more color to this bright dish. With so many styles of cooking and such variety of flavors, this book offers new fresh food adventures on every page. Recipe reprinted with publisher’s permission from A Change of Appetite . Saffron and hot spices, sweet tomato flesh, clean acidic yogurt, there is an irresistible interplay of flavors here. Try to make sure you get some of the saffron juices to smear the labneh; the golden streaks on creamy white yogurt look beautiful. Make this a complete main course by serving couscous on the side, or try kamut flavored with preserved lemons. You can sprinkle either pistachios or almonds on top. Make the labneh the day before you want to serve the dish. Line a strainer with a piece of cheesecloth and set it over a bowl. Mix the yogurt with the garlic, herbs, salt, and black pepper. Transfer to the cloth, tie it up, and refrigerate. The yogurt will lose moisture over the next 24 hours, producing a firmer, "cheeselike" substance. Help it along by giving it a squeeze every so often. Preheat the oven to 375°F. Halve the tomatoes and lay them in a single layer in a large roasting pan (or two small pans). Mix the regular olive oil, harissa, and saffron and pour the dressing over the tomatoes. Turn the tomatoes over in the oil to make sure they are well coated, ending with them cut side up. Sprinkle with the sugar and season. Roast in the oven for about 45 minutes, or until caramelized and slightly shrunken. Let cool a little. 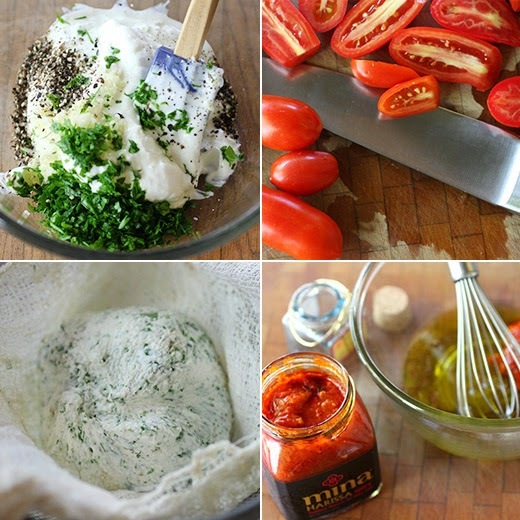 Take the labneh out of its cloth. Carefully move the tomatoes (they will be fragile and can fall apart easily) to a serving plate, dotting nuggets of the labneh among them as you work. You can also toast the flatbread, break it up, and arrange it among the tomatoes as well (or serve it on the side). Pour on any cooking juices that have collected in the tomato roasting pan, being sure to douse the flatbread if you have included it within the dish. Sprinkle the almonds over the top, then heat another good pinch of saffron stamens with the lemon juice in a small saucepan. Add the extra virgin oil and mix with a spoon. Spoon the mixture over the dish; the golden dressing looks beautiful against the white labneh. Sprinkle with the cilantro and serve warm, or at room temperature. If you’re familiar with the Yummy Supper blog, then you already know about the beautiful photos and the fresh, lovely food. And now, more recipes have been collected for the brand new Yummy Supper book by Erin Scott. I was delighted to receive a copy. The book doesn’t read at all like a specific-diet cookbook. It’s not about sacrificing certain ingredients or making difficult compromises. Instead, it’s about what foods work naturally and deliciously for gluten-free eating. The book is full of seasonal, healthy food; some family favorites; a few sweet treats; and the dishes just happen to be gluten-free. Of course, there are recipes that could be prepared with or without gluten. For instance, when bread or pasta is included, you could easily choose your preferred type. But mostly, the ingredients are whole foods that fit well into most diets. In the Eggs chapter, there are pretty, little Savory Custards with Wild Nettles; a buttery, tender Soft Scramble with Slab of Aged Cheddar + Arugula; and summery Baked Eggs on a Bed of Roasted Cherry Tomatoes. In the Veg chapter, you’ll find Parsnip Crisps, Mushroom Lovers’ Galette with Herby Goat Cheese, and Caramelized Brussels Sprouts with a Splash of Saba. There are also drinks, seafood dishes, meat and poultry recipes, dishes with grains and seeds, a chapter focusing on nuts, another for fruit, and Kid Favorites. The Simple Almond Torte is made with almond meal and no flour and honey instead of refined sugar. The Bali Garden Stew is a hearty chicken stew that’s packed with vegetables and made spicy with chiles. There’s a lot to love here, and it was hard to decide where to start. 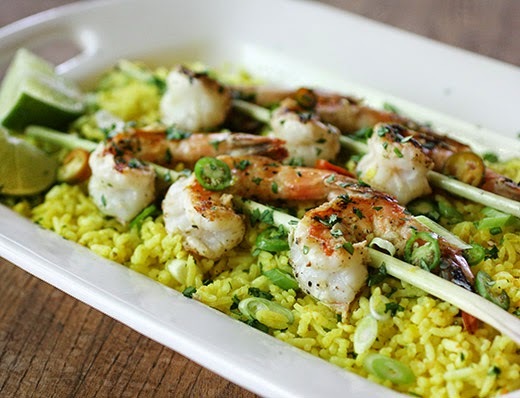 I chose the skewered shrimp with lemongrass because it seemed like a great meal for a warm summer evening. 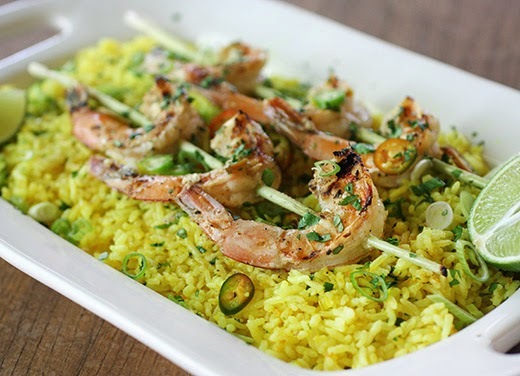 The grilled shrimp were served on a bed of fragrant, flavorful yellow rice. Before grilling, the shrimp were marinated in a mix of lime juice, canola oil, chopped garlic, chopped ginger, and salt and pepper. 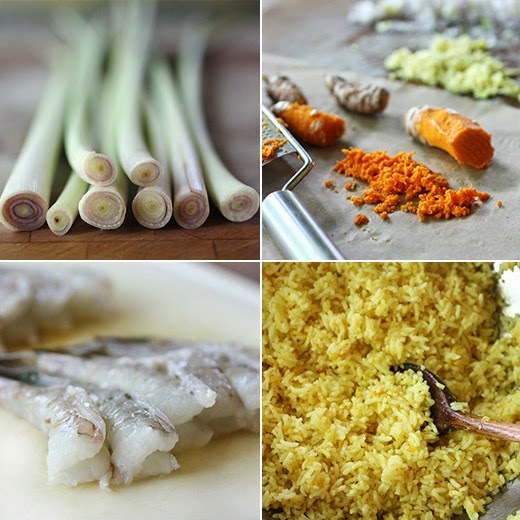 Lemongrass stalks were trimmed, and the outside layer was removed from each so they could be used as skewers. Small holes were poked in the shrimp so they could be slid onto the lemongrass stalks, and the skewers were placed in a shallow pan with the marinade. Meanwhile, jasmine rice was rinsed and drained and then cooked until tender. It was left to sit off the heat for a bit before being used. Minced shallots were cooked in butter, and finely chopped lemongrass, grated fresh turmeric and ginger, and minced garlic were added. The cooked rice was stirred into the spices, and coconut milk and cilantro were added. The shrimp were grilled for a few minutes per side and then served on top of the yellow rice with sliced green onion and chiles. First, this was possibly the most delicious rice I’ve ever tasted. It was rich from the butter and coconut milk and flavored with the mix of spices. The fresh turmeric gave it a pretty, sunny, yellow color, and it was exactly what belonged with the shrimp. The shrimp picked up great flavor from the marinade, and the lemongrass skewers were fragrant after warming on the grill. I’ll be reaching for this book often for dishes that I know I can share with friends avoiding gluten and for the kind of food that I like to cook. I wasn’t kidding when I said that I want ice cream for every meal during the summer. 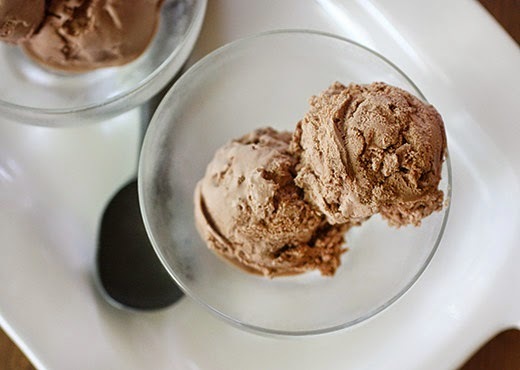 And, this Milk Chocolate Ice Cream is simple enough to make that I really could have it for every meal. It’s from The Real Food Cookbook by Nina Planck, and I received a review copy. This is a book of uncomplicated, traditional dishes made with fresh, seasonal ingredients. Plank writes: “The ingredients are timeless, not trendy; the methods are classic rather than rule-breaking.” The recipes are personal. For instance, she tells us the story of how she has come to make Chicken Soup and how it’s never going to be the same as the chicken soup her husband remembers from childhood. The dishes also reflect her upbringing on a farm, her experience having created London’s first modern farmers’ market, and her focus on healthful, whole foods. The recipe for Deviled Eggs is more about using really good, farm-raised eggs than it is about particular seasonings or technique. There are drinks, salads, soups, main dishes, sides, breads, and sweets. I want to try the Ricotta Pesto while my basil plants are still going strong. And, the Griddled Red Peppers could be used in so many ways, it would be ideal to have a constant supply of them in the refrigerator. I’ve marked the page for the not-too-sweet Coeur a la Creme with Raspberry Sauce. With all the recipes in the Sweets chapter, you’ll find a preference for a little less sugar than usual and a nice simplicity to the approach. I was taken in by the Milk Chocolate Ice Cream because it’s intended to be like cold chocolate milk. This isn’t a turbo, intense chocolate experience. Instead, it’s an easy-going, milky chocolate ice cream. It’s perfect, summer comfort food. There are no eggs in this ice cream. Making it is simply a matter of heating cream and milk and dissolving a very small amount of sugar in it. I actually used honey rather than sugar. Once the milk and cream mixture was hot, a broken chocolate bar was added and stirred in until melted and smooth. I used a locally-made chocolate from artisanal, bean-to-bar Kiskadee Chocolates. Only three and a half ounces of chocolate is needed, and I used about half of an 85% cacao bar and half of a 60% cacao bar. The cream and milk mixture with the melted chocolate was cooled and then churned in an ice cream maker. To serve, this ice cream is best when allowed to soften. It could be served directly from the machine after churning, or if it’s been placed in the freezer, let it sit in the refrigerator for a bit before scooping. The title of this book gets it exactly right. This isn’t fancy food or unusual food or food for any particular trend. It is simply real food from a personal point of view. Whether you follow the recipes exactly or take inspiration to make them your own, there are a lot of great ideas here to add to your own cooking repertoire. Recipe reprinted with publisher's permission from The Real Food Cookbook . In chocolate bars, I like austerity, and in chocolate mousse, intensity, but with ice cream the effect I want is akin to cold chocolate milk: in a word, milky. 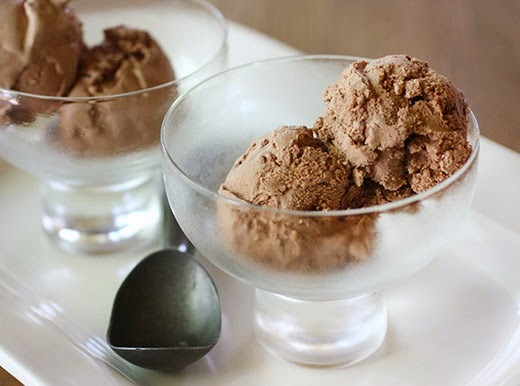 There may be more decadent chocolate ice creams, and there are certainly more complicated ones, but this is exactly what I’m looking for: it calls for simple ingredients I always have on hand, and it’s terribly simple. 1. Put the cream, milk, and sugar in a pan. Mix well and heat gently. 2. 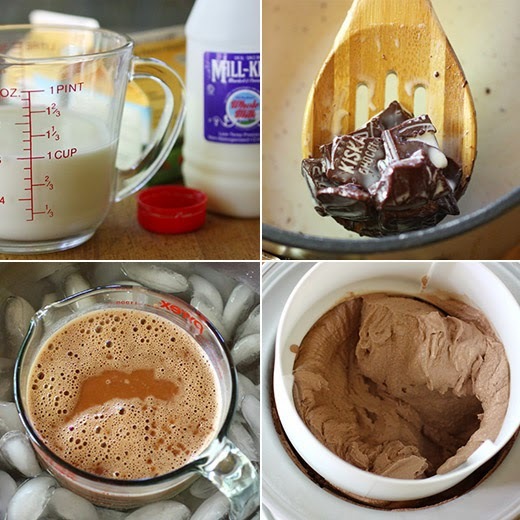 Break up the chocolate, drop it in the milk, and melt it completely, mixing well. 3. Chill thoroughly. Mix it once more before you churn it; the chocolate sometimes settles. 4. Churn it in your machine as instructed. Okra season is in full swing, and I’ve been trying some different ways of cooking it thanks to the new book Okra: A Savor the South Cookbook by Virginia Willis. Back in April, I attended a class taught by Virginia Willis at Central Market Cooking School with a media pass and posted photos on my Facebook page. I’ve been holding onto the book, waiting for the weeks when bags of okra appear in our CSA boxes. The book, of course, shows off several Southern okra dishes, and then there are okra recipes from around the world. I’ve made a Greek-style dish of okra and tomatoes before that’s very similar to the Greek Okra Ragout in the book. Other global dishes include Nigerian Black-Eyed Pea and Okra Fritters, Egyptian Okra and Chickpeas, Indian Spicy Sweet Okra with Peanuts, and Jamaican Curried Shrimp and Okra. The Southern okra recipes include several classics and some new ideas as well. There are different versions of fried okra, gumbos, and stewed okra. A couple of weeks ago, I tried the Oven-Fried Okra which involves dipping sliced okra into a buttermilk and egg batter, dusting the pieces with cornmeal, and baking them on a baking sheet coated with oil. The crispy okra was every bit as good as deep-fried okra and made a great snack with cold beer. 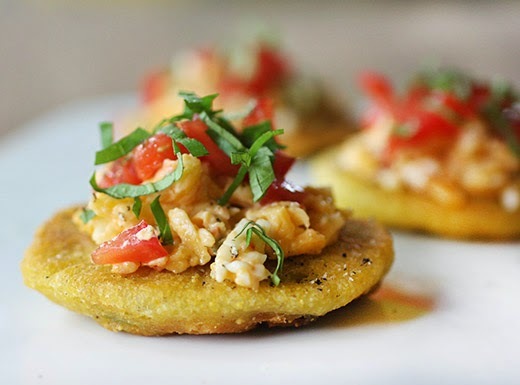 The next recipe on my to-try list was the Okra Cornmeal Cakes. Sliced okra was mixed into a cornmeal batter and fried into golden, tender rounds. The recipe suggests stacking the cakes with a pimento cheese filling with sliced tomato and lettuce to make little sandwiches. I served them open-faced with a mound of toppings instead. And, there are options for the fillings or toppings like goat cheese, ricotta, or herbed cream cheese and avocado, microgreens, or sprouts. But, nothing says Southern food like pimento cheese and summer tomatoes. To make the cakes, two cups of cornmeal, two teaspoons baking soda, and a teaspoon of salt were combined in a mixing bowl. In a separate bowl, an egg was whisked with one and a half cups of water, and that mixture was added to the dry ingredients and whisked until smooth. 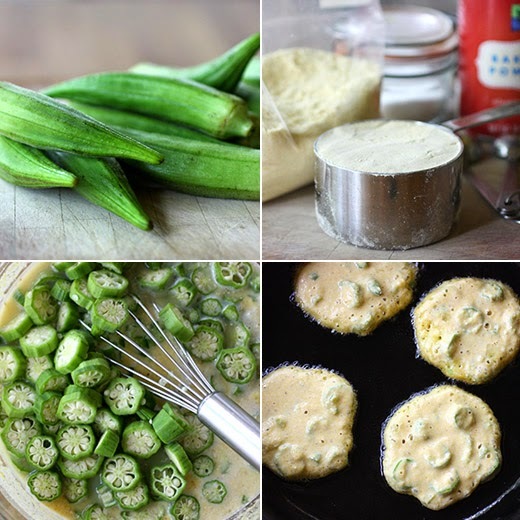 A jalapeno was seeded and finely chopped, a clove of garlic was minced to a paste, and eight ounces of okra was cut into small slices, and all of that was added to the batter. Oil was heated in a cast iron skillet, and then one-quarter cup of batter was poured into the hot oil to form each cake. They cooked for a few minutes on each side, were drained on a towel-lined baking sheet, and were sprinkled with salt and pepper. 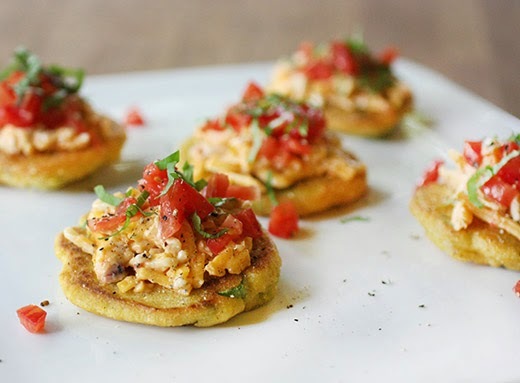 I topped the caked with a spoonful of pimento cheese, chopped tomatoes, and thinly sliced basil. I’ve realized I have a thing for little, vegetable cakes stacked with delicious toppings. I seem to gravitate to this type of dish. But, this was a great version of the concept for summer. I’m already sold on okra and require no conversion. For anyone who still needs some convincing about this healthy vegetable, this new book could hold the inspiration that changes your mind.